Home Development API Are Family Office Investments a Viable Alternative to Venture Capital? A wealth management company which invests assets on behalf of wealthy individual or groups of wealthy individuals. Though family offices date back to 15th century Florence, during the rise of the Medicis, there has been a recent proliferation of the format due principally to the recent explosion of tech-generated wealth. Single-family offices focus on managing the wealth of a single individual or family. Multi-family offices manage the wealth of multiple families who pool their investable capital together for a more formal/institutional investment arrangement and to reap cost economies of scale. How Does Family Office Investing Differ from Venture Capital? Venture capitalists raise funds with a 10- to 12-year lifecycle and focus exclusively on building a diversified portfolio of multiple early-stage companies. Family offices have “evergreen” capital (patient capital with an indefinite fund life) and do not have an investment horizon. Venture capitalists compete for deals via PR, marketing, press releases, fund sizes, and news about portfolio companies while family offices value discretion and confidentiality above all, irrespective of how active they are in their investments. You require a relatively large quantum of growth equity or debt and prefer the patient variety, complete with investors who will be in it for the long haul. Building a halo effect to attract talent is not a requisite for your business model. Given the family office preference for discretion, they are extremely media-shy relative to their venture capital counterparts. You are specifically seeking a strong entrepreneurial orientation in DNA or background, or specific domain expertise and advice alongside patient capital. How Can an Expert Prepare Your Company to Receive an Investment? Creating or fine-tuning your pitch, including your financial model, projections, and “story,” thus positioning you and your venture to specifically speak to the value points of family offices. Access to a deep network of relevant family offices, by industry, who have a track record of cutting checks. Offering advice and guidance on working with family offices once the investment has been made. Family offices began investing in early-stage ventures centuries ago. In 15th century Florence, the Medici family actively supported young artists by investing in their works (venture capital of its day), patronage which provided the start for some of the greatest masters of all time from Leonardo Da Vinci and Michelangelo to Galileo and Botticelli. Amazingly, this was 500 years before the first formal venture capital firm (ARDC) was founded. Fast forward to the present day. You are probably familiar with such household VC names as Sequoia, Andreessen Horowitz, Benchmark Capital, and Kleiner Perkins—firms that comprise the investor bases for ultra-successful startups such as Uber, Facebook, and WeWork. But make no mistake: Capital allocated by family offices also exists within these capital stacks, albeit quietly. One simply wouldn’t come across these secretive names unless one knew where to look. For example, in the upcoming IPO wave, there are unicorns such as Pluralsight that are backed by a multi-family office, ICONIQ, belonging to the Zuckerberg and Sandberg families, alongside mainstream venture capitalists like Insight Venture Partners. Over the last five years, I have met many an entrepreneur who has expressed curiosity about the largely under-tapped world of family offices (“famos”). Some entrepreneurs come across low-profile famos in high-profile deals, while others are introduced or inadvertently advised to reach out to famos by traditional/existing investors, as an alternative source of capital. This article isn’t intended to advocate for or against family offices as a captive investment source. It is instead intended as a broadly informative guide for those less familiar with the niche. I also hope to expose its potential as a source of patient and strategic capital for the entrepreneur who takes the time to seek it out and understand its workings. Famos are a force to be reckoned with in the fundraising and financing world, and will only grow in influence. Tech and the wealth creation that has and will continue to stem from it will increase their size and number in the coming years. The modus operandi of famos share similarities with those of fund-of-funds investors and direct/principal investors. As family offices look to diversify, early-stage technology ventures and private companies will continue to represent a low volatility option for growth at a reasonable price (GARP). Given the contrast between family offices and venture capital firms, both in terms of investment style as well as in post-investment manner, entrepreneurs looking to work with either should first seek to get sufficiently educated. Family offices are a wealth management concept wherein ultra-high net worth individuals or families pool their liquid wealth with the express aim of preserving and growing it. Pioneered by John D. Rockefeller, this asset class has mushroomed over the past three to five years, owing to the deluge of wealth created by capital markets following the 2008 boom in stocks and bonds. The roles, responsibilities, tasks, and duties of family offices range from the mundane (payment of bills to their staff) to the specialty, such as investing capital and managing complex portfolios across varying asset types and classes. The latter of these two categories is usually led by a professional asset manager, employed to steward the office’s investments and investment strategies—an individual/team typically overseen by a member or group of members of the family. Family office wealth can be first, second, or multi-generational, ranging from “old money” such as that of John D. Rockefeller to new-age technology affluence such as Sergey Brin’s Bayshore Global Management. Family offices can be single-family offices, which bear a high cost of management of at least $1 million, or multi-family offices where multiple families pool resources to create a single office. There are more than 10,000 family offices worldwide and $5.1 trillion of ultra high net worth wealth according to Ernst and Young’s family office guide. Family offices are based in a few key cities which satisfy a raft of requirements for the globally-mobile and asset-rich families, which include strong governance institutions and practices, a private/secretive banking system, and political stability. Luxembourg, Hong Kong, London, and Switzerland have long been hot favorites, with Dubai not too far behind. I shall refrain from any discourse around the intricacies/workings of family offices and the lifestyles that their progenitors lead. 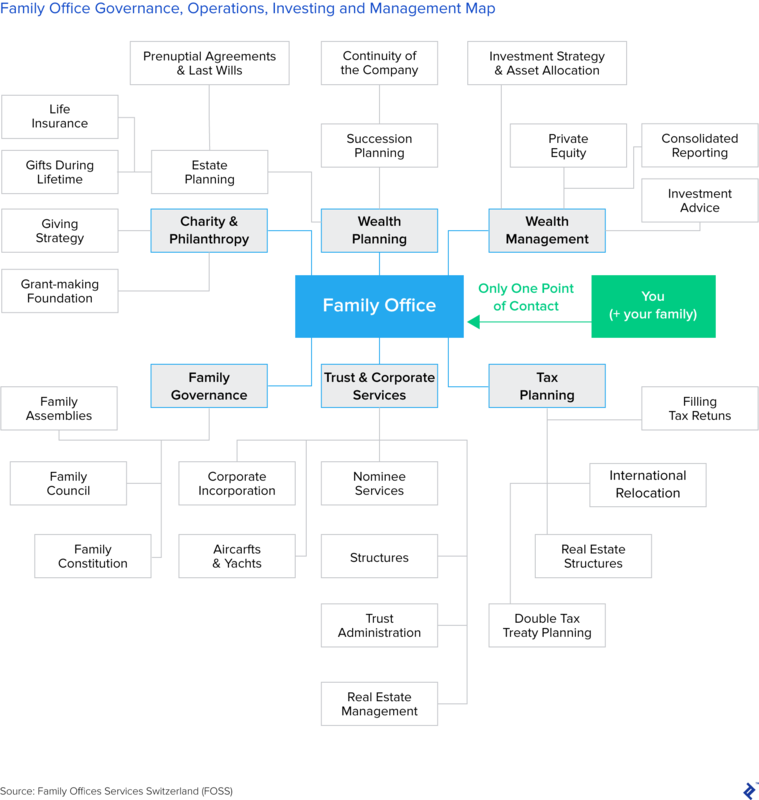 For those seeking more information, examples of the autonomy, pace, operation, and style of a typical family office can be found here, as seen through the eyes of an ex-employee. Remember, though, that, overall, for a cohort that is about 10,000 in size, any generalization should be taken with a grain of salt. Multi-family offices (mfamos) are different from single-family offices (sfamos) in that they manage the wealth of multiple families. While retaining their entrepreneurial DNA and focusing on long-term value creation, these groups start to look more like institutional investors. In addition to preserving capital for families, Mfamos tend also to be far more serious and formal about governance, the independence of their investment decision-making process, and growing the collective assets under management. They also tend to be more structured about deal sourcing and deal performance. Let’s start with a top-down view of what famos typically invest in. Based on a report by UBS, the origins of a given family’s wealth determines the family offices’ risk appetite, its investment style, and its allocation choices. US and Asian families are most keen on investing in “growth” assets, with heavy weighting toward venture capital and private equity. iCapital research shows that first-generation sfamos tend to prefer alternative assets such as real estate, private equity, and venture capital. In addition to the generation, country, and origin of wealth, the sfamos’ strategy is also defined by the size and stage (institutional maturity/experience) of the family office itself. Longer-tenured family offices increasingly employ experienced management teams to invest their capital across an array specialty asset classes. This is especially true for active positions in equity and bond markets, given family offices have historically invested in hedge funds or private equity funds as fund-of-funds investors. The increasing size of Famos and desire to have stronger control over investments and outcomes has propelled them to “insource” professional management teams. As an asset class, private equity also holds some other advantages over hedge funds regarding family offices. It fits with families’ “emotional desire to back entrepreneurs and ideas they believe in,” according to Philip Higson, Vice Chairman of the family office group at UBS. The long-term nature of their capital. Family offices have private capital to be preserved across generations, unlike venture capital firms which have contractually shorter time horizons. Strong alignment of the founder with the entrepreneur. Owing to the entrepreneurial DNA of the founders of most family offices, younger, more inexperienced entrepreneurs stand to benefit tremendously from the insights and connections of the family. This functions much like a successful VC but without the drama and aggression. 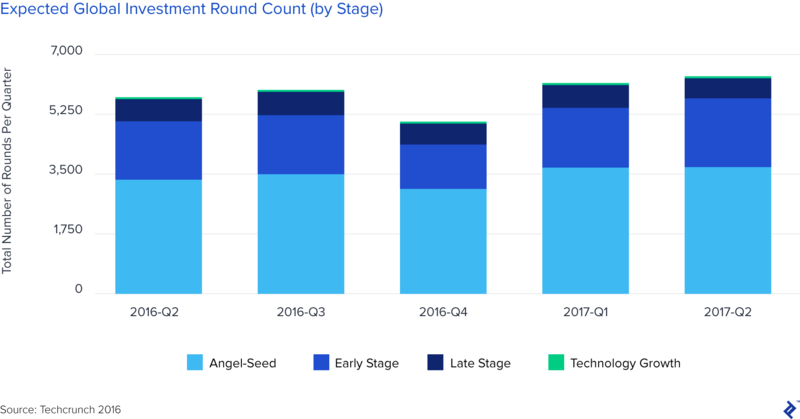 Given family offices typically invest in later stage venture deals, and invest larger quantums, one may accurately think of them as a relatively active source of capital for Series B+ rounds or rounds that require $25 million or more in growth equity (keeping in mind that series A rounds are rising in size). A former eCommerce entrepreneur investing in eCommerce startups due to unique insights. A real estate entrepreneur-backed family office investing exclusively in real estate ventures. Beyond courtship expectations, two other idiosyncrasies and associated consequences tend to be prevalent amongst most family offices—behaviors that are worth making you aware of. Please note that they have been anecdotally derived from a limited sample set, and as caveated previously, should only be used as a yard-stick. Confidentiality: Since family offices prefer their privacy, they may prefer to keep investment details quiet, with little to no PR. This aversion to publicity, unfortunately, does come at a cost to entrepreneurs. For one, it is much harder to build a halo effect with which to attract talent without splashy press releases and few household VC names. Integrity and communication: While this attribute is generally internalized by most institutional investors, family offices rely on it more due to their niche position within the broader capital markets. Remember, a VC like a16z (Andreessen Horowitz) will generally know more about a given sector, market cycle, strategic landscape, and availability of talent than the average family office. That said, family offices will always outstrip their venture capital counterparts as sources of “evergreen” capital who will stand by you even in times of distress, to the extent that your communication-style, transparency, and integrity match theirs. Famos are control-oriented. “More is less with communication”, and chemistry does matter. Said differently, less voluminous but more pointed interactions, in a style and format that the given Famo likes will be more effective than constant communication with reams of data. This is at odds with the preferences of most venture capital and traditional investors, so get to know your Famo well. It is hard to predict the behaviour of any given famo. Oftentimes, the only source of information about a given family office is a fellow founder who has previously taken money from said famo. The challenge is that there is no obvious or natural way to figure out who the other entrepreneurs are within the portfolio of a given family office, or meet them for deeper diligence without an introduction by the famo in question. Decision-making is inextricably linked to the original wealth creator of the family office or their offspring. Thus, it is important to have good chemistry with one or two people and not rely on the more democratic process that most often comprises traditional venture capital firms. And second, an associate partner at a VC may have more decision-making powers than an associate at a family office, so you may be ignored when trying to drive important decisions unless you talk to the right family member outright. Famos are limited in thematic investment focus and are instead more deal/entrepreneur focused. Important: The protagonists of Famos were professional entrepreneurs (and successful ones) before establishing their professional investment management company. Thus, investments and investment performance is only one dimension to a given family office, with many other reasons why an initial and then follow-on investment may or may not be made. Entrepreneurs should bear the following in mind as they prepare to initiate their respective searches for compatible family offices. A carefully planned, patiently executed, strategic search is the answer. As mentioned, famos deal in secrecy (they believe it necessary to protect their families’ interests). As such, it is unlikely that you will find Bill Gates’ Family Office with a website, let alone one that details its investment manager, its current portfolio, and a “contact us” link. Be prepared to get creative with your search. Famos deal in trust. Famos believe that trust between parties is the singular guiding principle for making an investment. As a function, it would behoove you to remember that “who you are and who connects you” is far more important that “what [sort of company] you are and what you are selling.” Cultural fit matters; positioning matters; quiet signals matter. Famos seek control. Family offices prefer a reasonable amount of control in their businesses, depending on their stage and the composition of their existing portfolio. Minority investments, which tend to be more the speed of venture capitalists, are the diametric opposite of the control investments that famos seek. Investment Stage matters. As alluded to in the previous point, family offices will scarcely invest at the pre-product, seed or even Series A stage unless they have unique insights into the business, industry or vertical. They don’t invest small check sizes, regardless of endowment, so sub $10- to $50 million raises will be difficult to close on. Famos tend not to take the lead. Very few family offices lead investment rounds, unless there is a long history with the entrepreneur. A quality/credible introduction goes a long way in both gaining the attention of a family office and for sure in goading them across the investment finish line. And naturally, a well developed Halo effect will rarely let you down. Context and framing are king. Most family offices will be based in developed countries, even for families who generated their wealth in emerging market. As such, taking the time to frame the opportunity you are presenting or the problem you are seeking to solve in a way that they can connect with or in the context of their home countries will take you much further than a glossy deck and financial model, though both are important. Friends and Fellow Founders: Friends or founders in similar sectors who have previously raised from family offices are a great starter resource. This route also passes a few qualification checks around interest, size of deal, and sector preferences. Remember, there is no investment barrier or fund allocation requirement for family offices. Databases: Resources such as family office networks and events are ballooning with time. Stay abreast of these. Professional Intermediaries: Investment bankers and wealth managers who service family offices are oftentimes happy to make introductions in order to add value to their clients. Since these clients are the intermediaries’ crown jewels, their recommendations will first require diligence. Investment Firms: Family offices are increasingly part of syndicates/consortiums for deals, and strong introductions can occasionally come to them from other institutional investment firms (private equity, venture capital, or hedge funds). 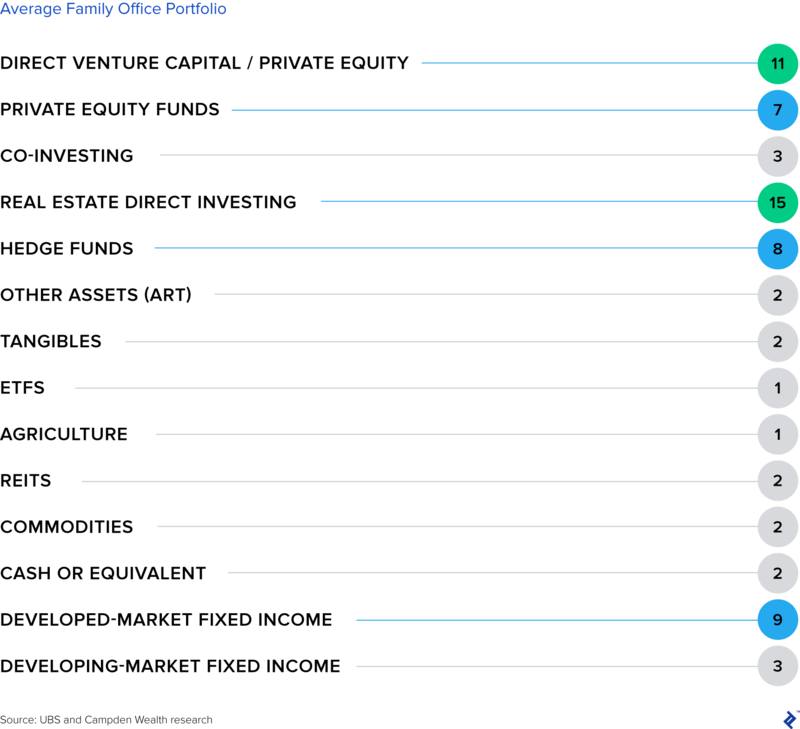 Seek out the Largest Offices: Family offices don’t invest more than 5 to 10% of their net worth into venture capital; the differential goes to traditional private equity and hedge funds, direct stock and bond portfolios, and real estate. This implies that for entrepreneurs seeking funding, larger family offices ($2 to $10 billion in net worth) are better places to start the search relative to smaller, niche families who may be in wait for the “perfect deal” but usually follow other professional institutions. For both the initiated and uninitiated, family offices represent a deep but largely untapped well of venture funding for the later-stage entrepreneur who has taken the time to understand the niche’s workings. As detailed, though they exhibit their captive set of peculiar habits and largely lack consistency in their investment styles, organization structures, and track records, they nonetheless represent some of the most patient and long-term supportive sources of capital in today’s markets. What is an ultra high net worth individual? An ultra high net worth individual is a person who has more than $30 million in investable/disposable wealth, excluding their primary residence and collectible assets. There are more than 226,000 such individuals in the world as of 2018. A multi-family office is a group of high net worth individuals who pool investable capital into a wealth management company. This company manages, grows and/or preserves their capital by investing in a range of instruments/asset classes professionally while benefiting from cost economies of scale. Are family offices institutional investors? Small family offices are not considered institutional investors as they are not regulated. As they grow and employ investment professionals, however, they adopt institutional best practices and invest in more exotic instruments. At this juncture, they begin to look and feel like institutional investors.